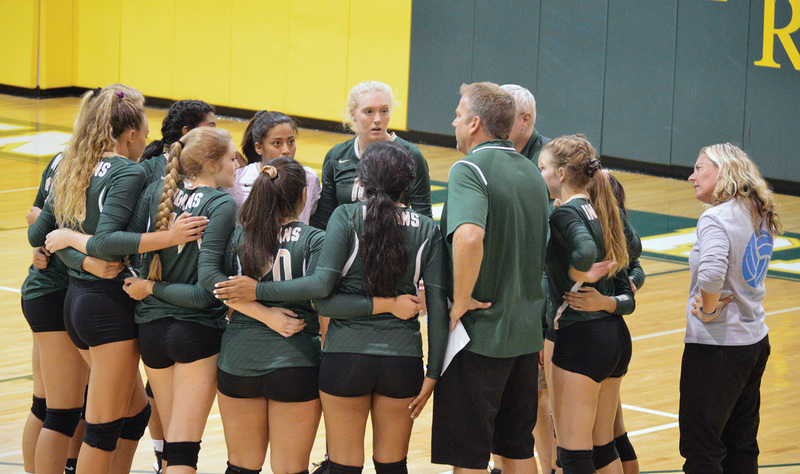 Indian River volleyball players huddle up during their matchup vs. Worcester Prep on Friday, Sept. 7. The 2018 team is not concerned about any perceived senior leadership issues. Despite the noted lack of seniors, this squad is loaded with experienced and talented players up and down the roster. That talent was on display in their first two matches of the season this past week. IR rolled to an easy 3-0 shutout over visiting Worcester Prep last Friday, Sept. 7, with game scores of 25-11, 25-2 and 25-13. “I was very happy with what I saw from the girls,” head coach Jim Barnes said of the game last Friday. “They did exactly what we’ve asked them to do and executed. I think we are comfortable with our lineup, which we have not been. We’ve been trying to figure out where to put the girls to best use their talents, and where they feel most comfortable. It was a total team effort from start to finish for the Indians on Sept. 7, with a trio of juniors leading the way. Marianni Chavez posted a stat line of one kill, two aces, one dig and 12 assists. Raychel Ehlers added 11 kills to go with a pair of aces. Jessica Amezcua drilled a match-high seven aces for IR. Sophomore Nicole Woody chipped in with two aces and six assists. Junior Siera Johnson picked up a kill and four aces as well, while sophomore Skylar Kneller was credited with four kills and three aces. All told, the Indians recorded 22 kills and 24 aces in the contest with the Mallards. On Tuesday night’s match with Caesar Rodney, the Indians wound up with a heartbreaking 3-2 setback versus the Riders. It was quite the reversal of fortune, considering that the Indians had taken the first two games 25-21 and 25-15. However, the Riders responded taking the final three games of the match by scores of 25-17, 25-22 and 15-10. Ehlers posted 28 kills to go along with one block and 10 digs. Amezcua added two aces and 14 digs, while Chavez contributed two kills, two digs and an incredible 37 assists. The disappointing loss for IR proved to be a small slice of revenge for Caesar Rodney, after the Indians had taken out the Riders last year, 3-2. IR had little time to dwell on the results of the Sept. 11 game, as they were set to be back at it again on Thursday, Sept. 14, with a match against Delmar, after Coastal Point press time. Results can be found on the Coastal Point sports Facebook and Twitter pages.